Your Eminence, at what stage are we since you, Cardinal Walter Brandmüller and the two recently deceased cardinals, Carlo Caffarra and Joachim Meisner, made the dubia public a year ago this week? One year after the publication of the dubia on Amoris Laetitia, which have not received any response from the Holy Father, we observe an increasing confusion about the ways of interpreting the apostolic exhortation. Hence our concern for the Church’s situation and for her mission in the world becomes ever more urgent. I, of course, remain in regular communication with Cardinal Walter Brandmüller regarding these gravest of matters. Both of us remain in profound union with the two late Cardinals Joachim Meisner and Carlo Caffarra, who have passed away in the course of the last months. Thus I once again present the gravity of the situation, which is continually worsening. Much has been said about the dangers of the ambiguous nature of Chapter 8 of Amoris Laetitia, stressing that it is open to much interpretation. Why is clarity so important? Clarity in teaching does not imply any rigidity, which would impede people from walking on the Gospel path, but, on the contrary, clarity provides the light necessary for accompanying families on the way of Christian discipleship. It is obscurity that keeps us from seeing the path and that hinders the evangelizing action of the Church. As Jesus says, “Night comes, when no one can work” (John 9:4). Could you explain more about the current situation in light of the dubia? The current situation, far from diminishing the importance of the dubia or questions, makes them still more pressing. It is not at all, as some have suggested, a matter of an “affected ignorance,” which poses doubts only because it is unwilling to accept a given teaching. Rather, the concern was and is to determine precisely what the Pope wanted to teach as Successor of Peter. Thus the questions arise from the recognition of the Petrine office that Pope Francis has received from the Lord for the purpose of confirming his brothers in the faith. The magisterium is God’s gift to the Church to provide clarity on issues that regard the deposit of the faith. By their very nature, affirmations that lack this clarity cannot be qualified expressions of the magisterium. Why is it so dangerous, in your view, for there to be differing interpretations of Amoris Laetitia, particularly over the pastoral approach of those living in irregular unions, and specifically over civilly-remarried divorcees not living in continence and receiving Holy Communion? It is evident that some of Amoris Laetitia’s indications regarding essential aspects of the faith and of the practice of the Christian life have received various interpretations that are divergent and at times incompatible with each other. This incontestable fact confirms that these indications are ambivalent, permitting a variety of readings, many of which are in contrast to Catholic doctrine. The questions we cardinals have raised thus regard what exactly the Holy Father has taught and how his teaching harmonizes with the deposit of the faith, given that the magisterium “is not above the word of God, but serves it, teaching only what has been handed on, listening to it devoutly, guarding it scrupulously and explaining it faithfully in accord with a divine commission and with the help of the Holy Spirit; it draws from this one deposit of faith everything which it presents for belief as divinely revealed” (Vatican Council II, dogmatic constitution Dei Verbum, 10). Hasn’t the Pope made clear where he stands through his letter to Argentine bishops, in which he said there is “no other interpretation” than the guidelines those bishops issued — guidelines that left open the possibility of some sexually active unmarried couples receiving the Holy Eucharist? Contrary to what some have claimed, we cannot consider the Pope’s letter to the bishops of the region of Buenos Aires, written shortly before receiving the dubia and containing comments on the bishops’ pastoral guidelines, an adequate response to the questions posed. On the one hand, these guidelines can be interpreted in different ways; on the other, it is not clear that this letter is a magisterial text, in which the Pope intended to speak to the universal Church as the Successor of Peter. The fact that the letter first became known because it had been leaked to the press — and was only later made public by the Holy See — raises a reasonable doubt about the Holy Father’s intention to direct it to the universal Church. In addition, it would turn out to be quite astonishing — and contrary to Pope Francis’ explicitly formulated desire to leave the concrete application of Amoris Laetitia to the bishops of each country (Amoris Laetitia, 3) — that now he should impose on the universal Church what are only the concrete directives of a particular region. And shouldn’t the different dispositions promulgated by various bishops in their dioceses from Philadelphia to Malta then all be considered invalid? A teaching that is not sufficiently determined with respect to its authority and its effective content cannot cast into doubt the clarity of the Church’s constant teaching, which, in any case, remains always normative. Are you also concerned that, by some bishops’ conferences allowing certain remarried divorcees living more uxorio (having sexual relations) to receive Holy Communion without a firm purpose of amendment, they are contradicting previous papal teaching, in particular Pope St. John Paul II’s apostolic exhortation Familiaris Consortio? Yes, the dubia or questions remain open. Those who assert that the discipline taught by Familiaris Consortio, 84 has changed contradict each other when it comes to explaining the reasons and the consequences. Some go as far as to say that the divorced in a new union, who continue to live more uxorio, do not find themselves in an objective state of mortal sin (citing in support Amoris Laetitia, 303); others deny this interpretation (citing in support Amoris Laetitia, 305), yet completely leave it up to the judgment of conscience to determine the criteria of access to the sacraments. It seems that the goal of the interpreters is to arrive, in whatever way, at a change in discipline, while the reasons they adduce to this end are of no importance, nor do they show any concern about how much they put into danger essential matters of the deposit of faith. What tangible effect has this mix of interpretations had? This hermeneutical confusion has already produced a sad result. In fact, the ambiguity regarding a concrete point of the pastoral care of the family has led some to propose a paradigm shift regarding the Church’s entire moral practice, the foundations of which have been authoritatively taught by St. John Paul II in his encyclical Veritatis Splendor. Some have said the most pernicious effect of all of this is that it represents an attack on the sacraments as well as the Church’s moral teaching. How is this so? Over and above the moral debate, the sense of the ecclesial sacramental practice is increasingly eroding in the Church, especially when it comes to the sacraments of penance and the Eucharist. The decisive criterion for admission to the sacraments has always been the coherence of a person’s way of life with the teachings of Jesus. If instead the decisive criterion were now to become the absence of a person’s subjective culpability — as some interpreters of Amoris Laetitia have suggested — would this not change the very nature of the sacraments? In fact, the sacraments are not private encounters with God, nor are they means of social integration into a community. Rather, they are visible and effective signs of our incorporation into Christ and his Church, in and by which the Church publicly professes and actuates her faith. Thus, by turning a person’s subjective diminished culpability or lack of culpability into the decisive criterion for the admission to the sacraments, one would endanger the very regula fidei, the rule of faith, which the sacraments proclaim and actuate not only by words, but also by visible gestures. How could the Church continue to be the universal sacrament of salvation if the meaning of the sacraments were to be emptied of its content? Despite you and many others, including more than 250 academics and priests who have signed a filial correction, clearly having very serious misgivings about the effects of these passages in Amoris Laetitia, and because you have so far received no response from the Holy Father, are you here making a final plea to him? Yes, for these grave reasons, one year after rendering public the dubia, I again turn to the Holy Father and to the whole Church, emphasizing how urgent it is that, in exercising the ministry he has received from the Lord, the Pope should confirm his brothers in the faith with a clear expression of the teaching regarding both Christian morality and the meaning of the Church’s sacramental practice. 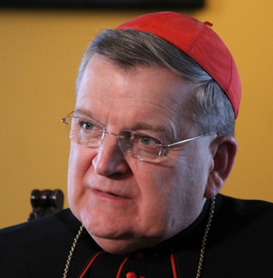 In an exclusive Register interview, he elaborates about why four cardinals were impelled to seek clarity about the papal exhortation’s controversial elements.